Bursting with detail and filled with residential accommodations, the 2019 Newmar Ventana Diesel RV is designed to feel like home. 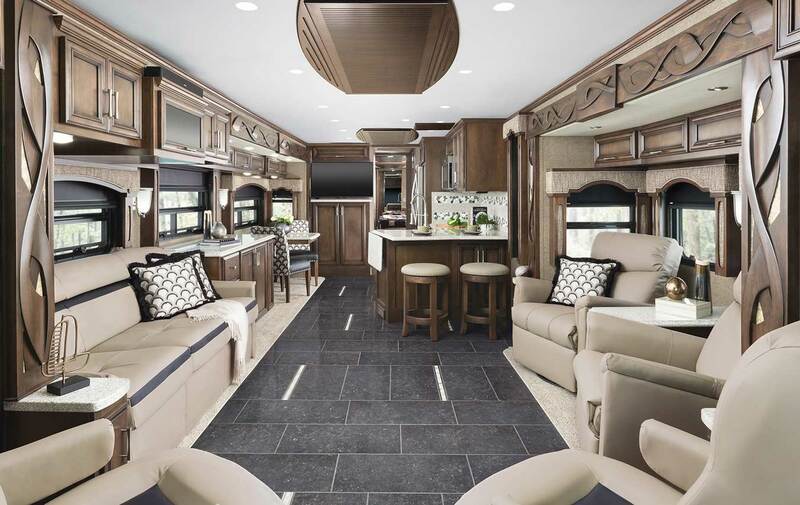 The 2019 Newmar Ventana Diesel RV offers floor plans from 34 feet to 43 feet in length that include the 3407, 3412, 3426, 3709, 3717, 4002, 4037, 4054, 4310, 4326, 4348, and 4369. The 2019 Newmar Ventana Diesel RV for sale offers three great color themes you can choose from: Lagoon with a Charcoal Tweed awning, Muslin with a Linen Tweed awning, or Windwood with a Charcoal Tweed awning. Hurry to your favorite dealer, Ancira RV Boerne to check out the 2019 Newmar Ventana RV for sale. The 2019 Newmar Ventana Diesel RV for sale near me comes with a standard Wi-Fi signal booster and select floor plans even offer power-adjustable theater seating or a sofa that quickly converts to bunk beds, only at Ancira RV in Boerne. The 2019 Newmar Ventana Diesel RV for sale in offers 13 available floor plans at 34, 37, 40, or 43 feet with keyless entry and power baggage door locks, and Freightliner® XCR or Spartan® K2 tag axle chassis for the 40- 43-foot floor plans only. 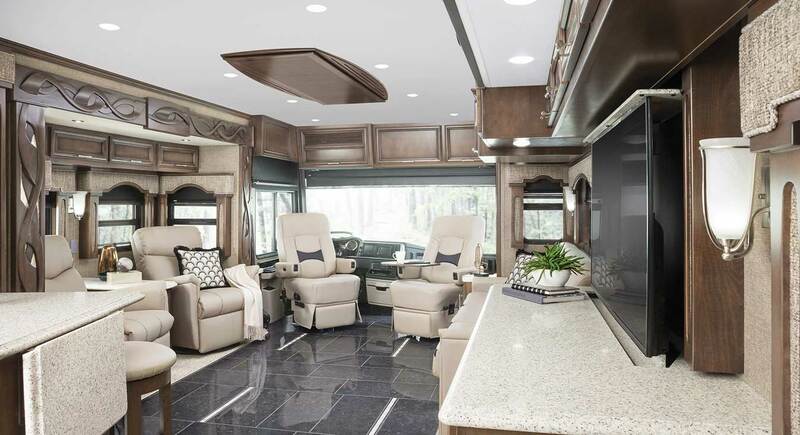 The 2019 Newmar Ventana Diesel RV gives you the options of interior themes from Lagoon Interior, Muslin Interior, or Windwood Interior, as well as your preference of cabinets from Bermuda Glazed Maple, Newport Glazed Maple, or Wicker Glazed Maple. Carmel Glazed Cherry Cabinets with Mitered Designer Doors–Opt. The 2019 Newmar Ventana Diesel RV for sale has so many great features and accessories, you'll feel right at home with a Bose® Solo Soundbar Sound System, and a Sony® LED 4K TV and DVD player in the living room and bedroom areas. The 2019 Newmar Ventana Diesel RV for sale near me offers you a cable TV connection, frameless Double-Pane tinted safety glass windows, skylight above the shower, slideout awning cover, cruise control, ABS, and wall mounted sensors for heating and air conditioning. The 2019 Newmar Ventana Diesel RV is available with 12 different floor plans, offers the available Sleep Number® adjustable mattress, and select floor plans incorporate a full-wall wardrobe and an available Whirlpool® stacked washer and dryer. Modern appliance options are aplenty, from a Fisher & Paykel® dishwasher to a spacious Whirlpool® French-door refrigerator in the 2019 Newmar Ventana Diesel RV. Come get yours today at your trusted Ancira RV in Boerne located at 30500 IH 10 West Boerne, Texas 78006. You can also call us at (830) 981-9000 for more information on the 2019 Newmar Ventana Diesel RV for sale near me. Ancira RV of Boerne proudly serves Helotes, Boerne, New Braunfels, Leon Valley, San Marcos, Austin, Alamo Heights, and Live Oak, Texas. Contact dealer for full details, check owner's literature for full vehicle and warranty details on the 2019 Newmar Ventana Diesel RV for sale.